In many organizations, personnel costs are one of the largest budget items. Leaders in any business, regardless of size, need people aligned and working together for high levels of performance. To achieve this high level performance, a “Best Practice” is to utilize employee assessments. They help reveal more consistent, in-depth and objective information about employees than most managers can uncover on their own. Candidates have a tendency to embellish their qualifications. According to the Society of Human Resource Management (SHRM), 53% of resumes they reviewed contained false information. This number may increase as jobs become harder to find, or candidates become more desperate for work. There is a tendency to “filter-scrub” employee information. In today’s litigious society, former employers share little, especially anything negative. Even internal candidates may not be who they appear in their performance reviews. Sometimes well-meaning supervisors are less than objective. People are difficult to read. Looking at a candidate is often like looking at an iceberg. 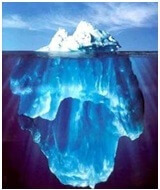 90% of the “total person” is below the surface, not easily observed or understood. Valid assessments uncover truthful information in a very cost and time effective manner. This solid information enables better management of your workforce, with greater productivity and profits. Screening: Good pre-hire assessments will quickly screen out applicants who lack the fundamental skills, qualifications and/or behaviors you are seeking. Selecting: Selection assessments often support other related activities such as resume reviews and interviews. For example, knowing what and how to probe during the interview can ultimately help make a better hiring decision. On-boarding and Ramping Up: Having more insight into capabilities and behaviors of new employees better prepares how the new employee and manager work together. Not only does the employee become productive faster, but it builds employee confidence and enthusiasm. Managing: Managers that understand the reason for behaviors, employees and especially their own, find motivating employees easier. It also helps to navigate situations that involve conflict, stress or frustration. Developing: Assessments help gather input on training needs. This results in more targeted training, as well as a way to help drive accountability for more ROI on training dollars. Planning: Organizations seeking “bench strength” or strategic workforce or succession planning find assessments play a powerful role. Other uses include navigating mergers or acquisitions, and reorganizations. Objectivity is especially valuable during these times of upheaval and change. One of the most valuable assets of your organization are your people. Invest a lot in them, and you get a lot back. We encourage you to contact us today to let us show you firsthand the valuable information assessments reveal and how you can apply our talent management solutions to help maximize your workforce productivity.